Last week I tried Doodle Bowling out on my Android and it didn't do much for me. It wasn't bad, but as I've stated countless times before... it's hard to do justice to a 'sport' in video game format. The Wii was able to pull it off for bowling with it's new fangled controller and outstanding physics, but with a touch screen... I don't know. So I decided to give Magic Bowling a chance today. The game's graphics are decent and the sound works. It has a cycling audio track that sounds like it came from a real bowling alley. The graphics aren't without fault, though. There are times when my pin appears visually stuck in the floor or the ball never visually makes contact with a pin, yet said pin goes flying. The physics aren't very good either. They way the pins knock into one another based on the angles in which they are hit just feels a bit off. I could live with this if the controls worked consistently, but they don't. When bowling you can drag the ball to adjust the start position of your bowler and then you are supposed to swipe down the alley. I can tell you right now that swiping straight up doesn't mean you are throwing the ball in a straight line unless you happen to be in the very center of the alley. Again, I have to make guesses as to how it's all supposed to work. 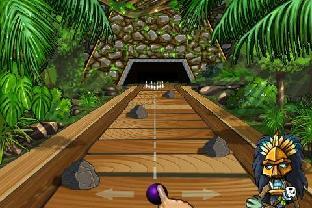 The game advertises that it supports spin on the ball. Indeed it does, but this is nullified by other issues. I can't tell you how many times I've touched the ball and done a quick, seemingly accurate swipe and nothing happens. Nada! The controls in this game are poor on many fronts and given that that's 99% of bowling that's a bad sign. The game gets cute after you move onto the second bowling alley. There's a little directional indicator at the top of the screen along with a strength indicator. I presume, given that the alley is now outdoors and on an island, that this is supposed to be wind strength. Given the weight of a bowling ball and how much effect it has on the ball I'd have to say it's a typhoon. Once wind strength gets over 1 (which is most of the time) it doesn't seem to matter what I do... gutter ball. Fortunately, the AI is SO strong that it bowls an equally poor game in all of the wind. Final Score: 21-18, which is laughable for bowling. Obviously I can't and don't recommend this game. What's sad is that this isn't an amateur hour title. Many aspects are professionally done, but the controls ruin the game. And if it wasn't for the controls then the physics would probably have hampered the game. If you want bowling on your Android then I'd recommend getting the free Doodle Bowling. It played quite well for a bowling game. As for Magic Bowling, I can only give it 2.5/5 stars for a game that isn't a strike or even a spare. There is a free demo version available in the Market if you'd like to give it a whirl yourself. Let me start this review by saying that I'm not into fishing. I don't view it as much of a sport. I see people by the river spending their day fishing and just can grasp the thrill of doing so. I just don't get why someone would choose to spend their time fishing unless, of course, they desperately need the food. And I say this not to belittle those that enjoy fishing as I know that there's no shortage of people that would think the activities I enjoy are equally boring, but rather to give you context for my review. Fishin' 2 Go isn't as much of a game as it is a simulation. I've asked for flight simulators in the past. Simulators can be fun, but the central point of such software is to focus less on the fun and more on being an accurate model of a real world activity. So, upon loading Fishin' 2 Go, the first thing I can appreciate is the fact that there are instructions along with some basic information on fishing. This is information that I didn't know and is nice because it means the 'game' could also be educational to someone that is not into fishing and wanting to learn. Next, I figure that I should probably take the time to actually catch a fish so I try. The neat thing here is your mobile phone becomes a bit like a WiiMote in bowling. You hold down an on screen button, pull your phone back, flick it forward with your wrist as if casting a real fishing line, and release the button to let go of the line. Plunk! You then see the line drop into the water. Before doing this you can choose different lures and gears from a wide selection of choices, but not knowing anything about this stuff I figured it wouldn't matter to me. 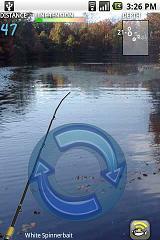 You then wind your reel by touching and dragging on the screen in a clockwise motion and repeat until you get a catch. Eventually you'll get a catch. I did, after letting a few get away and then consulting the instructions once again, so I can safely guarantee you will. At that point there are two meters at the top of the screen. One shows how taught your fishing line is. You need to make sure it stays out of the red. Then there's the fish's energy level. You need to tire the fish out and then bring it home. The game then shows you what kind of fish you caught and gives you the option of tossing it back or keeping it. The game offers several locations to choose from for fishing and each is nice looking with ripples in the water and some nice background scenery. It provides the tranquility of a real fishing experience, or so I am told, until the fly shows up and starts to be a nuisance. The sound effects are in line with a fishing experience. The control are all touch screen and accelerometer based. My only issue with the controls is that of the 72 clockwise rotations that my finger has to do to bring my line back in. There is an 'auto' button for that, but from what I understand I want the fish to see the lure moving through the water in order to catch them. So, what does this non-fisherman think? This is a very well done fishing simulation that fits in the palm of your hand. If going fishing sounds like a good time to you and moving that experience to Android still sounds appealing then this is going to be a dream come true. If you're like me and can't understand why anyone would spend their time engaging in this activity then you won't like it just as I have no personal interest in playing this ever again. And if you're borderline then try the free demo version. All in all, I can recognize the work that this game took, see that a good job was done, and also see that the developer is reasonably active in supporting and improving their product. 4/5 stars. MiniSquadron! is among the cluster of games that support Open Feint that were released last week. It is a port of an iPhone game that has received much acclaim in which you control a plane in a 2D horizontal scrolling environment. Your goal? To shoot down anything and everything that comes your way. Upon starting a game you get to choose a plane from 56 choices. Of course, 55 of them are locked away initially, but over time you earn the right to use them. 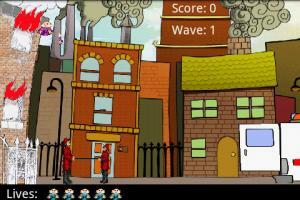 You then fly onto the screen, shoot down some geese to get acquainted with the controls and then in come the enemies. The graphics are colorful and attractive and the sound consists of a nice background soundtrack along with appropriate sound effects for crashing, gun fire, ...etc. The background sound track does eventually get old, but it can easily be turned off from the Options screen. Controls are primarily touch screen based with an on screen directional pad that allows you to simply point where you want your plane to go and a fire button. The game also supports multiplayer although only over local Wi-Fi. One thing that's really nice is that the directional pad makes it easy to fly where you want to. Sure, it takes some time to get used to. But after a while you'll be enjoying the satisfaction of not only shooting down an enemy, but being able to tail them and shoot them down with consecutive shots. That's one of my favorite rushes that I can get from a plane game. In addition to enemies, there are also bonus stars to collect that will yield special abilities such as 'ghost' which temporarily makes your plane invisible while you continue to pump lead into your adversaries. In this game the air space is limited so it's possible to not only fly too high (and stall), but also too far to the left or right. If you do that then your plane will automatically turn around and head back in the other direction. As for issues with the game, my biggest is the lack of any support for my hardware DPad/keyboard. I really wish more companies would take note of this facility on some Android devices. It can't be that hard to support. I am pleased to say that App2SD support is present which is nice given that this is a sizable game. Oh, and this game also reminds me that Android owners need a good 'flight simulator' game. Summary? The presentation is great, the game plays smooth, and the controls are even good enough for me to play for an extended session of game play. The in game bonus stars and the armada of available planes provide a reason to keep playing beyond the simple fact that this game is lots of fun. 5/5 stars. A game play video is available below and there is a lite version in the Market to try out. There have been many games trying to create a tie in to Sudoku. So far I haven't seen one that succeeds with respect to such a tie in. Here's a game that doesn't try to make such a claim when it probably should. 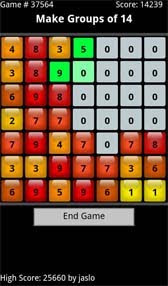 Slitherlink is a puzzle game that relies on similar logical deductions as a game like Sudoku while offering a very different play experience. First, what is this game about? 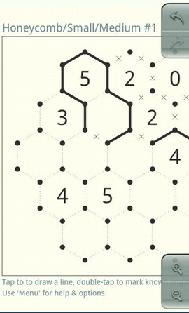 In Slitherlink you have a board of squares or hexes and you're going to try and create a loop using the edges of these spaces. Some of these spaces are blank and some have a number in. Numbers in spaces indicate how many sides must be included in this loop. When I first played I had an inclination that this was a logic puzzle like Sudoku, but it felt different. It took me about 5 minutes to solve my first small, hex puzzle on easy mode. So why is it different? Let's look at Sudoku. In Sudoku the difficulty levels are more varied without doing things like doubling the size of the puzzle. Some cells have simple logical relationships to solve them where just two elements combine to provide a square's number and others can be quite complex. Slitherlink doesn't have that same range of difficulty. There are logical relationships and after solving several puzzles I think the 0's are the most valuable spaces as they provide the most information (followed by spaces with numbers in on the edge of the puzzle). I'm also relatively new to this so don't take that to the bank. Yet, Slitherlink is both interesting and mind bending for similar and different reasons. I could yap and yap about it, but the bottom line is that you need to try this game and feel your own brain churn in order to understand what I'm getting at. At the same time, don't be disillusioned when it's not the same as Sudoku. Problems? The only real issue I have is that on larger puzzles there's a lot of scrolling back and forth as the entire puzzle doesn't fit on screen at a decent size. I'm not sure it's really practical to bother with those on a mobile screen. But the Android tablets are coming, right? It also gets a bit tight tapping on edges even on the small puzzles. However, as you can easily undo and correct any errors that's really not a problem. If you don't like Sudoku then I think it's a safe bet that you won't like this. It's a puzzle game and it requires a fair amount of brain burning (or a LOT of trial and error) to solve. If you've got that kind of mind then this will be a real treat for you and if not then it will be torture. Please note that there are SEVERAL games in the Market called SlitherLink and that this (Ejelta's version) does have a demo. 4/5 stars. ﻿﻿HandyGames is one of my favorite mobile game developers so I'm embarrassed to say that I missed Guns'n'Glory when it was first released. I only discovered it when they FINALLY released an update to Panzer Panic. Once a game company reaches a certain level of quality you know that each of their games deserves to be checked out. Guns'n'Glory - Bring in the cannons! 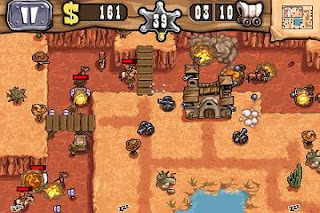 Guns'n'Glory is a tower defense game which is a genre that's really made a splash with mobile, touch screen devices as the interface works so well for such a game. If you don't know what I mean by a 'tower defense' game here it is in a nutshell (otherwise you can skip the rest of the paragraph). In a tower defense game you have something to protect aka 'the tower'. You also have weapons that you deploy to defend the tower. Once you've placed these weapons the baddies show up and march their way on over to your tower in the most direct way possible even if it means a machine gun is pointing right at their skull. Weapons fire, baddies march, you gain money for each baddie killed, you lose life for each one that arrives and assaults your tower. You then reinvest any money gained (even during a round) to buy new stuff and make it even harder on the baddies, but the baddies get even baddier. So, there's this tug of war going on with you building your defenses and them getting stronger with improved speed and firepower until they finally overpower you. It's fun and strategic. GnG's graphics are nice, but are a little on the small side. As you'll have to select characters on the touch screen with your finger sometimes I found that difficult when characters were close together. Sound is great in true HandyGames style. And, aside from the closeness issue due to the small graphics, the touch screen control of tapping on guys and then dragging to move them worked reasonably well. Touch screens were made for tower defense games! One of the differences in this game from other tower defense games in that you're not building a maze with weapons that are fixed and thus are not trying to slow the enemy by forcing them to have to move a greater distance. Instead, your position along the canyon walls plays a greater importance as your defenses can move. This allows you to open fire on one side of the canyon and then catch the settlers again for a second round on the other side if you are quick enough. HandyGames has elected to try the Glu Mobile method of selling this game in that there's a full featured free version with advertising in it and a paid version that removes the ads. However, Handy has done a better job of making sure the ads are annoying. I can't imagine anyone that likes this game and really gets into it won't want to sacrifice the $3 it takes to get rid of the ads that are ever present at the bottom of the game's screen throughout the duration of your game. In summary, this is a really nice take on the tower defense genre whether you're a seasoned veteran looking for another challenge or have never heard of this kind of game before. It certainly isn't enough to really stand out in this over represented genre, but is certainly at the top of the heap. I also like the 'free with advertising' model of distribution although I wonder if that will be deemed to work. Maybe it is as we're seeing more and more games move to that model and it's tough for the paid games to compete against free. But it's not easy building revenue off of advertising as I know from firsthand experience. 4.5/5 stars for another great game from HandyGames. Edit 3: Yesterday was an attempt at 'free for a day' apps, but the Android Market doesn't support that very well according to Camel. Ultimately it sounds like an experiment that didn't work out. The QR Codes below are for the lite versions of their games and will be left up so you can try them. Edit 2: And we appear to be back to a paid full version and an ad supported, limited demo version with 'updates' just waiting for me. I have a query in to find out what's going on. Edit: A Market search on 'Camel Games' no longer includes these titles. Using the QR Codes (with the Barcode Reader app in the Market) DOES still let you get them. Apparently they have all gone the 'Ad Supported' route and their titles changed with a suffix of (Ad) to represent that. Holy Mackerel, Batman! Last week Open Feint joins the Android family. 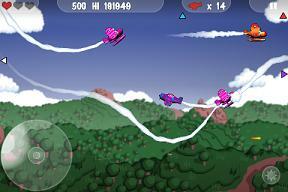 This week Camel Games decides to make Shoot U!, Flight Director, and Blow Up all free!? What next? All three of these games are great, support App2SD, and now deserve a place on your smartphone. Go get 'em!!! Sometimes it just seems odd that just a simple concept can be so much fun. Flick Kick Field Goal is one such game. I've been playing it all weekend trying to better my score, and trying to figure out what the draw is. Certainly football is part of the draw and releasing it during football season works in their favor. But why, when there's the similar (and free) Paper Toss that I've already played to death do I persist with just one more field goal attempt? It's gotten so bad that I even had a dream last night where I was the holder on a field goal. We missed. The concept in Flick Kick Field Goal is simple. Drag your finger up the screen in a kicking motion and try to kick the ball between the field goal posts (or to 'split the uprights' in fancy, football lingo). Complexity is added to this task as your distance and angle will change with subsequent shots, and then there's the wind to deal with. The game claims it simulates real stadium wind, but I don't really know how to test that having never kicked a field goal in real stadium wind. The cool thing about the wind, and it took awhile for me to notice this, is that it's more than just a wind speed, but it also includes a direction. I think this is among a couple kick things that made this stand out from a game like Paper Toss. You could be kicking into the wind, or have to deal with the wind not being your friend. That's the game in a nutshell... drag your finger... did I score?... drag your finger... did I score? But it just doesn't sound as fun as it really is when I say it that way, does it? The game includes four modes of play. First there's Practice Mode in which you'll be positioned at different points on the field until you make each kick. Next, there's Sudden Death in which you try and see how many you can kick in a row. Sudden Death is the mode I've been glued to. Next, there's Arcade mode in which you're given 3 kicks per ball placement and can earn bonuses by making 3 or more kicks in a row. Finally, there's Time Attack mode in which you have to make as many field goals as you can in two minutes and earn bonus time for every made field goal. The graphics on this game are very nice and sharp. The 3D view of the stadium is pretty and the animation of the ball is smooth as it rotates end over end. When the ball crosses the plane of the goal posts you see that point and thus get feedback as to how on or off target you were. And, all throughout, there are positive reinforcement messages that are displayed and the crowd cheering you on. Speaking of cheering, the audio is also excellent from things such as the boot of the ball to the patriotic title screen music to the roar (or boos) of the crowd. And the controls? Nice and simple. Although I do feel that sometimes my kick should be straight when it hooks. I doubt that has anything to do with the game and I can't really tell if it's me or the Droid's hardware giving occasional bad data. Maybe it's just the translation of a finger touch to a single point on the screen. Am I over analyzing this enough? This game is part of the bunch of Open Feint games that were released this past week and so it supports a complete online community of players to compete against. My high in Sudden Death mode stands at 17 and I haven't been able to come close in 36 hours of play. In conclusion, probably the most amusing thing to me is how we now have a great punt return game, a nice little quarterbacking game, and now an excellent field goal kicking game, but cannot seem to attract a solid, full featured football game to Android. Maybe last week's announcement of Madden '11 coming will happen sooner than later. Maybe we'll figure out how to glue all three of these mini-games together into one rock solid football game. Until then, at $0.99 this should provide much more than a dollar's worth of entertainment to football fans everywhere and then some. 4.5/5 stars for a game that is up and IT'S GOOD. But please add App2SD support... that shouldn't even be an issue anymore. Edit: This review was updated as it was published prematurely and was missing one of the modes of game play in the 3rd paragraph. Like so many games, SketchWars includes the names of two immensely successful games in its Market description in an attempt to ride on their coat tails. In this case it's the arcade classic 'Asteroids' and the XBLA hit 'Geometry Wars'. I'm surprised 'doodle' wasn't used in the game's title as that's the graphical style of this game and I thought that, too, was in vogue. The reality is that, while the game may have similarities to both of these games, the control scheme makes it feel like something quite different for better and worse. SketchWars is a simple, arcade shooter with cute pencil and paper style graphics in which you play as the tip of a pen (I think) and have to destroy an infinite onslaught of enemies. You move around a piece of paper via tilting your smartphone, but be careful. If you go too far and fall off of the edge of the paper you're done for. Shooting is done by tapping where you want to fire. Destroying enemies sometimes results in the release of some little pellets that you can collect that act as score multipliers. Some enemies become blots on the page and you have to drag down the eraser to blot them out. The game offers four difficulty levels and also sports global leader boards so that you can complete against the world. 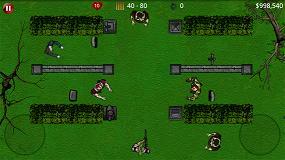 The doodle style graphics are done well and sound effects, such as the destruction of an enemy, are cued perfectly. There's no background music to mention that might add to or detract from the game. The controls are accurate and there is an option that will allow you to adjust the sensitivity of the tilt, although the default worked well for me. The big problem is that whenever I fire at an enemy I'm also blocking the screen with my big, fat hand and there's more than enough action for that to be a big problem. This game is already hard and it doesn't need that kind of external interference. How to address that? I don't know. Part of the charm of this game is how easy it is to fire by tapping anywhere so that just becomes part of the game albeit a frustrating part. In conclusion, at 0.99 euros (about $1.30) this game is definitely worth it and would be a fine arcade addition to any Android game collection. It's challenging, well done, and the online leader boards ensure that you know you've got a ways to go in order to consider yourself a competent player. One thing I did that I felt helped a bit with the issue of blocking the screen when I fire was to play the game in sideways mode and use both thumbs to fire. Unfortunately, that won't work with the blotter and the razor as they are just on one side. 4/5 stars. NumNom, currently on sale for $0.99, is a game that attracted me because of its comparison to Sudoku. I love Sudoku. NumNom is no Sudoku. To be fair, I think the goal is more so to get the Sudoku keyword in the Android Market description than to try and claim that it's like Sudoku. In fact, the description says that it's "easier than Sudoku" and with that I agree. NumNom is a math puzzle. You have a 7 x 7 grid of numbers from 1 to 9 and a target total and it's your job to highlight groups of numbers that add up to this total. 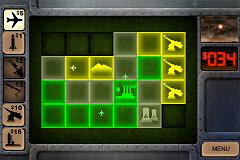 Highlighted blocks in a valid grouping are, in game terminology, popped and change to a gray 0 block. Blocks with a 0 on CAN be used in future groups, but for each 0 block used there is a penalty. As you use more 0 blocks to complete a grouping the penalty grows in a, presumably, nonlinear fashion. The one cool thing about this is that games are chosen by number and for each game #X the board always starts the board out the same. There are roughly 100,000 different boards to play on. This allows you to compete online for better solutions (i.e. higher scores) on a given board. I'm sure some will find analyzing a board and looking for a better solution satisfying. I don't. I much prefer a puzzle where I can either solve it or I'm left working on it until I do. I'm also the kind of gamer that doesn't care what kind of grade I earn when I complete a level... all I care about is getting the job done successfully. Consequently, I won't be replaying Fuzzies until I earn an A on each level as completing each level is enough for me. The interesting thing about my mentality is that all they have to do is create a benchmark score that I have to meet in order to pass and we'd be back in business again. Maybe, NumNom will add that one day. I suspect one reason it doesn't is the level of effort it would take to solve each of the 100,000 different puzzles. The graphics and sound are as you'd expect in a decent puzzle game and I didn't experience any issues with them. The touch control of selecting numbers works well and is aptly suited for a touch screen. The high score support is nice, but so far there aren't enough players on anything but the first few boards to be interesting. I'm #1 for board 54 on my first try which isn't saying much. In conclusion, this is pretty much a black or white game. Does adding up numbers that are close to each other on a board sound like a good time? Trying to find a better solution for a given board will surely appeal to some, but for me it doesn't hold my interest. The game does what it's trying to do well, but I'm not left feeling like I want to keep playing. For me this is an average, 3/5 stars, puzzle game, but I applaud the attempt at something new. and, given this game, apparently Fuzzy was a monkey. 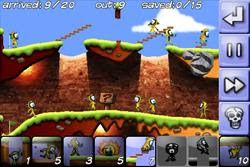 Polarbit's 'Fuzzies' is a straight up Lemmings clone with monkeys. I reviewed the similar Bunny Mania back in May. For those not familiar with Lemmings, the concept of game play is that of an action, puzzle game. Your critters are dropped onto a landscape and have to find their way to the exit with your help. Fortunately, you can equip them with tools like shovels for digging, bombs for blowing stuff up, and parachutes to assist with a long drop. If you can assist a predefined number of these critters in making their way to the exit then you beat the level and can advance. Fuzzies brings this formula to Android and offers 28 levels of play with the first 3 or 4 being more 'learn to play' levels. You've got sideways diggers, bottom diggers, parachutes, ceiling climbers, ...etc. The graphics are nice and sharp and the audio is pleasing. Controls rely entirely on the touch screen as you touch buttons to select actions and then touch monkeys to assign said actions. Unlike Lemmings, there are multiple exit points each designated by a red flag so you may have to get half of your monkeys over here and the other half over there. As they arrive, a rope drops out of the sky and carries the monkey to safety just like in real life. How does this stack up to Bunny Mania? Both have 28 levels, but Bunny Mania allows you to create your own levels and share them on the Internet. This has been a raging success and there are now 6 additional levels available. I poke fun, not at Bunny Mania for being considerate enough to offer this option, but at how many more people like to think about level design versus actually doing it. Heck, I still have plans to design a module for Neverwinter Nights (the original... not the sequel). On the graphics front, Fuzzies is superior. The graphics look sharper as they are a bit bigger. The buttons are crisper and easier to touch, once again due to the increased size. My only issue with Fuzzies (and it applied to Bunny Mania, too) is the lack of levels. 28 just doesn't seem like enough. Although, for a $2.99 game a dime a level isn't unfair. 4.5/5 stars for a game that could be great with more levels and a, dare I say it, level editor. Can you guide him, he's so cute! There's no used market (and the vendors love that you can't sell your purchased games... in fact, that's one reason they are less expensive). There's ample opportunity to release updated versions. Sometimes they never come... sometimes they do. Eliminated my control issues entirely from what I can tell. Added pool to the mix of games. It's often too easy to steam ahead and not look at updates to games from the past. This one deserves a second look unless, of course, you haven't even taken a first look. 5/5 stars. This is going to be short and sweet. Stay away from Adventure Quest! I'm in awe that they're charging for this as it's barely passable as free. In this game you're an adventurer. You start at home and get to create a customized character with stats like a name and... well, that's it... a name. You then choose to visit one of six locations of varying difficulty. In each of these locations monsters apparently are all waiting in a nice, orderly line to fight you one at a time. You fight until your health gets low enough and you have to consume a potion. If you're out of potions you flee... although you want some buffer as fleeing is not automatic. When you flee you return home where apparently you have an infinite supply of potions. You grab a few more and it's off again until you level up or die... of boredom. I checked dictionary.com for a definition of 'adventure' and 'quest' and this is neither. Oh, how I want to come up with cleverer ways to insult this game now that it's insulted me by wasting my time. At least I still have time to get a refund. 1/5 stars. And I think I might have been a bit too sweet. 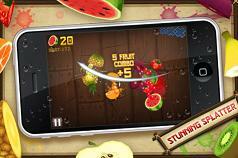 The iPhone game Fruit Ninja made the leap to Android today. The good? It's only $.99 so they're not sticking it to us with the usual doubling of price (or worse). It's a nice, well done game and it supports Open Feint for high scores. The bad? It's a whopping 16 MB and does not yet support App2SD and I, personally, like Fruit Pirate better. I think Fruit Ninja has nicer looking menus with animated fruit, but I really love the fact that in Fruit Pirate I can slice fruit and then swing back and slice the slices into even smaller pieces. And I'd be lying if I didn't admit that I've got a bias towards a developer like Wavecade that has been supporting Android for almost a year although this also shows what a blatant copy that Fruit Pirate is of Fruit Ninja. It'll be interesting to see how quickly HalfBrick responds to all of the clamoring for App2SD support. When I think of the RTS genre, my mind gravitates more towards a StarCraft experience where I control on screen units, have to collect resources, build new buildings, and then use these buildings and resources to construct new units for my conquest. Silo MAD is an RTS, but it differs from this tried and true formula. So the question becomes "good different or bad different?". When you first load Silo MAD you'll be greeted by a menu that includes the usual campaign and skirmish (aka quick play) modes along with a tutorial. The tutorial is very well done and teaches you the game quite nicely. The game is played on two screens. The first plays like a Missile Command arcade game where you can tap to fire missiles (and you pay for each one) or watch your automated defense structures fire away. The other screen shows the battlefield which is broken into squares. You'll begin with a factory and some base production and can send transports to overtake other territories. Transports can be shot down, but if they are not then they either convert an enemy territory to a neutral territory or a neutral one to yours. Some territories have things like mines (they look like mountains) on them that will increase your production. Other territories are vacant allowing you to build on them. This game can be played as a campaign or you can play individual skirmishes. The game offers five skill levels and three map sizes. After playing a game or two you start to understand that the ebb and flow of the game is similar to other RTS games where first you build an infrastructure to boost production then you fight the war. Balancing these two activities becomes the challenge. The graphics are good and the game offers quality audio. The controls work great and that's one thing I really appreciated about this game. Trying to play RTS games modeled after their PC counterpart often becomes a cramped experience. Plasmaworks identified that issue and rectified it with this game. They have produced a quality RTS that is very suited for a small, mobile screen. About the only issue I had were the teeny, tiny 'OK' buttons in the tutorial. Conclusion? 'Good different' all the way. The tutorial is well executed. The game isn't terribly complicated... I think there are only about 5 or 6 different structures to build/operate in the whole game. It's a challenge toggling back and forth between the arcadey defense screen and the overall map as you lay the groundwork for an assault. The game offers a good fell of building a war machine and winning a battle feels like an accomplishment. FInally, the five skill levels and different map sizes make this a game with some good, solid replayability well beyond the included campaign mode. 5/5 stars for a RTS game that I almost missed in a crowded Market. The full version of Soccer Says is currently a Market freebie. It bills itself as a Simon Says clone although I suspect they mean a clone of the old Simon electronic game. Simon Says is a kid's game that simply involves a player dictating actions to other players that they are only allowed to do if the command is preceded with "Simon Says". The Simon electronic game, on the other hand, is a pattern memorization game in which colored segments light up along with a tone in sequence and you have to replay the sequence by pressing on these same segments (which also serve as buttons). Honestly, I'd not have ever tried this if it wasn't free, but I'm glad I have. First, it's very well done with nice music and a soccer theme. You get a yellow card for your first failure and then a red card if you fail again at which point it's game over. The play area, instead of being four quarters of a circle, is the five hexes on a pictured soccer ball. The game has four levels... two that my memory is apparently too shot to unlock... and in the second level the ball spins. A spinning ball means you also have to keep track of where the first part of a sequence is and you'll have to remember the others as relative to that. It's a bigger deal than it sounds. I suspect that the third and fourth levels offer something even more intricate. If you're looking for a memory game or a game your kids can play that will help their memory then this is a great choice and, currently, the price is right. My only gripe is that it's got ads so it's not 100% free. In fact, I'd be a little upset if I paid for this and it had ads. Perhaps they're experimenting with a new business model... that I do not know. But I do know the game itself does what it's intended to very well. If you liked Simon or just want a nice, newmemory game then go get it while it's still free! Galaxy Breakout hit my Android phone a little over a week ago and I've been working on a review ever since. Step one was to take a look at the real Arkanoid so I did that last week, and that step gave me much more appreciation for this game. The goal of Galaxy Breakout is to be 'The best arkanoid style game on the Market!' although why Market is capitalized, but Arkanoid is not I may never know. Galaxy Breakout starts with that familiar text story trying to explain why you're playing the game. One thing I always find amusing, not that I'm perfect, are the grammatical issues with many games. Just this past week there was a game in the Market that talked about enemy basements. I wanted to reach out and explain that "While the enemy may have a basement, I think you mean 'base'". Here the last line reads "We want to be in silent again" and the last word in the second paragraph is misspelled. Proofread your story or hire me to proofread it. Am I being nitpicky enough? Are you here for the game and not the grammer? Err... grammar. Once you're done with the intro formalities, Galaxy Breakout dazzles you with a spiffy techno soundtrack. You have the usual menu with options allowing you to adjust the sound, choose among several styles of control, three different languages, and high or low performance hardware. The game also includes a level editor. I really like the flexibility that provides for future playability although it's tough getting people to jump on board the level design bandwagon. Finally, there's the "Arcade" button while probably should be labeled "Play". The "Arcade" button takes you to "Story" which then yields a choice of three planets to conquer, a choice of 4 skill levels, and finally actually game play. I tried the various controls and found the touch screen option to be far superior to tile or DPad mode and I spent most of my time on Kevitan in Novice mode. Once the game loads you'll see your ship launch. In touch screen mode you tap to release the ball and then drag back and forth on the screen to move. One thing I didn't like was that if I quickly drag to the other side of the screen it does take a split-second for the ship to move on over and catch up to me. This seems to be a conscious design decision as the game has a little triangular tick mark that shows when my finger is versus my on screen ship. I felt that this makes the game a little less smooth than I'd like. I also had occasional issues where the controls seemed to go almost crazy. They were sporadic, but present nonetheless. On the plus side, I do like the curved shape of the ship. It creates a much better feel that if I bounce the ball off a side it's going to be returned at a sharper angle then a head on return. As for a comparison to the game's mentor... first, it uses the whole screen for the display of the game's play field and not a postage stamp (see my Arkandoid review if you don't understand this comment). Next, it has all of the familiar power-ups such as the laser and enlarged shield. Finally, it also has little critters and stuff that invade the screen and must be destroyed. The graphics in the game are good and the audio is excellent. You can really tell that the developer knows his stuff. The only nagging issue is control. Fortunately there is a trial version of the game in the Market so you can test that out for yourself. As for its Arkanoidness this game is great. 4/5 stars. You can take a look at the game in action below. BadaBOO! Were you scared? Don't be. Boos are friendly and cute, and you're the equally friendly, although somewhat larger, Bada. Badaboo is esteemed Android game developer Polarbit's seventh game in the Android Market. It deviates from their more traditional 3D games and is more of a dexterity game. Actually it's six similarly themed games in one, but first the basics. In Badaboo you're the Bada and you'll be using your finger to flick him at the Boo's. That's right... just press down and quickly drag along the touch screen to flick and he'll scoot across the floor, bump into Boos, and they'll go flying every which way. Usually that's how you earn points. Furthermore, Badas and Boos range in three colors and when a Bada hits a Boo it changes color. If all the Boos and the Bada are the same color at the end of a flick then you'll get a nice bonus. So, what are the six games? Badaboo - Knock them around, as per the above instructions, to score big points. You get five flicks. Bada Marathon - I think you just play as long as you can stand it? BadaGolgoth - First, play some BadaBoo... then all the Boos turn into a giant monster that chases you. Run away until the monster blows. Repeat. BadaGolf - Knock the Boos into the holes. Some holes are colored and you can only knock like colored Boos into them. Survival - Badaboo, but new holes appear after each hit (or, from what I saw, every couple of hits). Don't knock the Boos into the holes. BadaTenor - Your Bada sings and the Boos try to annoy him by stepping on stage and singing. Knock them off of the stage. I get the feeling that Badaboo was designed, but then it was realized after the fact that Badaboo alone wasn't enough of a game so five variants were added. Some of these minigames are ok... others not so much. For example, in Badaboo I found my main tactic being to toss the Bada as hard as I could so it knocked into as much as possible. It didn't give me that feeling of playing pool and making a great shot. BadaGolf offered a similar experience in the early stages, but then when left with a couple Boos it becomes necessary to make some good, accurate shots to drive them into the holes. That was more enjoyable. Survival gets a little interesting once a few holes appear, but I think the game should start with a few holes to avoid my chaotic knocking everything around methodology. In conclusion, this is a game that's very well done. The graphics are cuteand simple. It has very nice audio and controls that work very well and are in tune with a touch screen device. It also offers leader boards for some competitive play and that includes versus our iPhone brethren. But once all is said and done, this a game that just falls short of making me want to play it more than once or twice. I had high hopes for a Polarbit title, but I guess they can't all be hits even when they are executed this well. 3.5/5 stars for a game that needs more 'game' in it. The game's video from the Polarbit website is below... it shows off the various included minigames. and I guess I should mention that Angry Birds has a FREE Beta available now. This has been the #1 game on the iPhone although I can't figure out why. Cuteness? But with over a quarter million downloads I have to be missing something... and it's great to see that an Android game can generate that kind of interest. Now I want to see how well a paid version sells. Now it's time for my weekly plea that you share about this website with your Android loving friends! After all, they would do it for you. Baby Savers is a reprise of an old DOS based game from the 80s. There's a burning building and lots of babies are trapped inside. The fire department has arrived and two fire fighters bring a trampoline over to the building. Babies are thrown out the window to the fire fighters who then proceed to bounce them over to safety and into the ambulance. The background graphics for the game are good and look almost cartoony with a building on the left animated with flames pouring out of two windows and smoke rising above. In the early stages babies are only thrown out of the top window. Perhaps later they are thrown from the bottom window, offering less reaction time, and if not that would be a nice addition to the game. Unfortunately the sound in the game is grating. Every baby bounced into the ambulance lets out a happy 'yaaay!' sound. The first time it's cute, the second time ok, and the twentieth? Aargh! An easy upgrade would be to make the babies have a variety of cute sounds and expressions. And what about babies smashing to the pavement? A soft crunch sound is heard. Now there's an opportunity for some controversial press. The possibilities are mind boggling! And the controls... just touch and drag along the bottom of the screen to more your trampoline back and forth. The controls are actually among the most impressive aspects of the game. It's entirely possible to make that speedy save and to rescue a baby from the jaws of death. The game's menu features a play button and an options button and the title of the game is in a strangely small typeface. Usually when there's a menu there are menu items. In this case there's one choice (other than returning to the main screen) and that choice is 'high scores'. So I ask "why an options menu?". Future expansion? It would also be nice if the 'high scores' option featured leader board support so I could compare my scores to others and have a goal to beat. If you'd like a goal my current high is 72. Upon playing, there's a noticeable absence of any choice of skill levels and the game begins (perhaps the window could be at different heights for different skill levels?). At first it's confidence builder time... the first few babies are all too easy. Things gradually ramp up to two, three, etc... babies at a time and eventually they'll get too difficult for anyone. Finally, I wish it was more obvious when a baby was safely on its way to the ambulance or needed another bounce. I've has many times when one fell just short when it looked like it might make it. It appears that babies just have to make contact with the open back door of the ambulance... although in real life that just wouldn't do. This game is just $.99 so it's hard to be too critical. Yet it's also easy as I see so many opportunities for improvement. I could see anvils being thrown out the window that damage the trampoline until the next baby smashes to the ground. My other issue is that I also don't see the game being fun for very long. You'll probably play it a few times and then shelve it because there's not enough variety to hold one's interest and little reason to play on. It needs more of a leveling system and things to see and unlock. I know this is a port of a game from the 80s and on that front it's an improvement, but in order to succeed nowadays it's going to need even more. 3.5/5 stars. Update: Shortly after writing this review I was able to exchange a couple emails with the developer who says that they are indeed going to be adding some of these suggestions and more into the game. One idea they had was to have flaming debris ignite the trampoline and then you have to tap it out. Very cool idea! And yes, the Options screen is indeed a stub for additional options. A demo version is also going to be released soon. So, in Overkill you've got a big, honking space ship and many missions (20, I think) to complete. Each level has a written objective and optional side objectives, but you are warned that sometimes you're just not going to complete the main objective without doing the extras. And that comment about the big, honking space ship? It's a bit of a joke having read many of the comments in the Android Market. I, personally, don't think the ship is too big... after all its size is actually what contributes to the game's difficulty and that seems to be very well balanced. Never mind the fact that a ship with shields, cannons, missiles, etc has to have somewhere to store all of this fire power. The game's graphics are very good and it's nice that there are actually options to scale back on the graphics for lower end Android devices. That's something the less professional developers do not do. The audio is also nice both from the musical accompaniment and the in game explosions and effects. And the controls... you can choose between tilt and keyboard/DPad controls. I first tried the game with tilt, but that just never feels good to me for any arcade shoot 'em ups such as this one. I'm sure that part of that feeling is that I was raised using an Atari joystick. Even the migration to a Nintendo Gamepad from the original 2600 style joystick was difficult. In this game tilt works about as well as I could expect, but I'm grateful that keyboard/DPad support is included. When using keyboard support you can choose between two different layouts. I don't know why I can't assign my own keys as that seems like a natural way to configure this, but one of the two choices worked well for me with the DPad on the right and the game felt much better. The game features four skill levels. I always play on easy because I'm horrible at these twitch arcade games, and that did allow me to start working my way through the missions. I then ramped the game up to Extreme difficulty and, sure enough, I was obliterated pretty quickly. The main change is more along the lines of asteroids being harder to destroy and armor power-ups giving less replenishment versus enemies moving at blindingly fast speeds. In essence they've just made the game less forgiving on the more challenging difficulty levels. The game itself starts with an intro to the current mission along with your objectives. In the case of the first one it's to look around (i.e. just make it to the end of the level) with side missions of collecting as many red and blue gems as you can. Red and blue gems equate to cash which will let you buy more powerful weapons. You're then off and blasting away... and you're ship is ALWAYS blasting. I generally don't like the whole auto-fire game play mechanism and have voiced that in some of my other reviews. But here they do something different... I may be firing away, but I also have three buttons controlling my shields, missiles, and other weaponry. Consequently, I still have to tap buttons to fire my guided missiles and use my shields at the most opportune times and that's always been my ultimate problem with such games... I want to be doing more than just moving left and right. Once missiles are fired or shields burned they take some time to replenish before you're back in business and can utilize them again. Icons at the bottom right of the screen keep you apprised of their status. 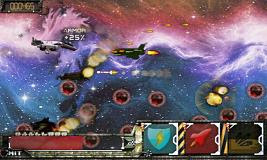 Each level also has some boss type enemies as well. So far rushing over, powering up the shields, and blasting away has served me well. You also need to keep an eye on your ship's strength. There's a lot going on and that's how it should be in this type of game. Playing this game is an enjoyable juggling act. Overkill is a very high quality game. It's also nice to have a side scroller in this under represented category on the Android Market. I think one of the reasons some of these old arcade games don't do well on the Android is because of the availability of emulators. Personally, I'll fall back on many classic, emulated games for an arcade rush as most of the games in the Market still can't beat them. This is one that does... easily. 5/5 stars. All right... we're all set up on Twitter as 'meandmydroid'. A synopsis of all reviews and news will be auto-tweeted over there so hopefully that will make keeping up with our regular game reviews an easier task. And hopefully you've noticed that we've added the ability to easily report content of interest directly on Facebook, Twitter, ...etc via the button bar at the bottom of each post. And the new QR codes (if you don't know what these are: they're the squareish shaped bar codes and you can use the Android app appropriate called 'Barcode Scanner' to scan them and easily navigate directly to the reviewed game in the Market). It's pretty neat and we're seeing more and more QR codes in our daily lives. I see Best Buy is using them in their advertising now. And the minor change to the site's layout. Dead End caught my eye because the screen shots looked good and running around a grave yard in a rampage plugging zombies full of lead sounded fun albeit familiar. The premise is simple. Zombies have killed your family (and everyone else). You're not just mad... you're REALLY mad. The kind of mad that makes you want to exterminate the whole zombie race. But where would they be? Duh! The local grave yard. So let's head on down and go zombie hunting. Dead End features three means of control. You can either touch the screen, or use an on screen virtual DPad and fire button, or tilt and tap to aim and shoot. Given the overhead perspective the on screen DPad wasn't good, but touching the screen worked well so I stuck with it. I can't imagine tilt being very good with the need to line up shots being as precise as it is. Next, come the zombies walking and groaning. The sound effects are really very good in this game. Groans! Screams! It's all here. You can also download an accompanying music track which is also very well done. Other devs that need help with sound should turn to these guys for assistance. And as the zombies approach you open fire. When you empty your clip you'll have to reload and that always happens at the most inopportune time giving the zombies precious seconds to approach and inevitably eat your brain. But in reading this do you see what's missing? I'm in awe... I don't move. I just stand there with my empty clip while I let the zombies feast. And once they're on top of me there seems to be little I can do. Occasionally I get a shot off, but I'm toast. With bite after bite I lose life after life. Am I missing something? And even on easy mode this game is quite hard. Once you realize some of this it becomes apparent that there really is no other control option than touch control. The game has a simple tutorial that explains the game. You'll also learn that you start with a few grenades and can buy more stuff by hitting the pause button in between waves. Tossing a grenade requires that you drag from your guy to the space you want to throw the grenade. Timing is everything as it takes a few ticks for it to blow. Dead End isn't as polished as I'd like it to be as it has crashed a few times while launching into a new game. Fortunately no crashes have occurred during actual game play. The game is also way too hard and come on... I should be able to move. You've read my complaints about games being too easy... not here. Easy mode is tough and in Extreme mode you'll be dead before you know it. I guess the zombies have to finish the job they started. 3/5 stars for a game that isn't bad, but also needs some more work if it's going to catch on. Edit: Dead End is currently on sale at $.99 (down from $2.99) and also has a lite (3 level) trial version available.